Set aboard a nineteenth century riverboat theater, this New York Times Notable book is the “captivating, thoughtful, and unforgettable” (Kathleen Grissom, author of The Kitchen House) story of a charmingly frank and naive seamstress who is blackmailed into saving runaways on the Underground Railroad, jeopardizing her freedom, her livelihood, and a new love. May becomes indispensable to Hugo and his troupe, and all goes well until she sees her cousin again. Comfort and Mrs. Howard are also traveling down the Ohio River, speaking out against slavery at the many riverside towns. May owes Mrs. Howard a debt she cannot repay, and Mrs. Howard uses the opportunity to enlist May in her network of shadowy characters who help ferry slaves across the river to freedom. Lying has never come easy to May, but now she is compelled to break the law, deceive all her newfound friends, and deflect the rising suspicions of a slave catcher. As May’s secrets become more tangled, the Floating Theatre readies for its biggest performance yet. May’s predicament could mean doom for her friends on board, including her beloved Hugo, unless she can figure out a way to entrap those who know her best. “Twain has his ‘Life on the Mississippi’. Conway’s life on the Ohio makes you see the place, through May’s eyes, in all its muddy glory” (New York Times Book Review). 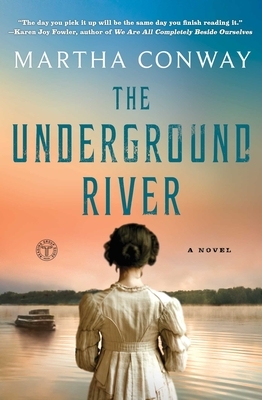 "The Underground River is both a dear love story and a page-turning adventure about the Underground Railroad—and an unwilling participant. An extraordinary cast of memorable characters gives this book irresistible appeal while the setting on the watery boundary between North and South places them in dangerous and morally ambiguous territory. A captivating, thoughtful, and unforgettable read." "Warning: The Underground River is a page-turner. Be prepared to stay up late reading, because once you start you won’t want to put it down. From the first page to the last, Martha Conway’s novel is riveting, immersing the reader in the adventures of an unlikely heroine who finds courage, independence and love amid the social turmoil of the Underground Railroad. Vividly drawn settings, original characters, and perilous situations make this mesmerizing book one you will remember for years to come." "Well-researched and gripping to the end, The Underground River is a vivid look at a pivotal chapter in American history." "The Underground River evokes Twain in both story and setting. A compelling book that would no doubt please the Master of the Mississippi....A compelling story of a young woman who is trying to find her way in a world that, in a few years, will be ripped apart by war. A tale worthy of Twain." "Thanks to the success of Colson Whitehead’s The Underground Railroad, the subject of the abolition movement is popular in fiction now. Conway (Thieving Forest; Sugarland) offers a novel take on the topic, and book groups will especially enjoy the distinctive setting, the rich historical details, and the thorny issues begging to be discussed." "Intriguing....A story that touches the mind and heart." "May herself is a marvelous creation, more than a little reminiscent of Mattie Ross in Charles Portis's True Grit....You'll root for her till the last page.... Add a gentle love story and an especially sinister villain...and The Underground River has the makings of a cult classic."